For the 2nd year, Pensacon did not disappoint! Feb 27th-28th could not have come fast enough for thousands of fans who waited in the cold to enter the Pensacola Bay Center. With record sales on Saturday (over 10,000 tickets sold) the event was forced to shut down sales. That didn’t stop the fans from having a great time while getting to visit their favorite actors, illustrators and vendors. Among the many guest in attendance, I got to meet some of my childhood favorites as well as meet a new ‘cast of characters’. First guest on my list to meet was Rae Dawn Chong! I remembered her from Commando which is one of my all time favorite movies. She’s bee on my Celebrity list for a while and I was super excited when Pensacon announced she would be attending! For those who might not remember, she is the daughter of Tommy Chong of Cheech and Chong, she always knew that show biz was in her future. “Yeah, I had no choice”she mentioned. She started as a musician but began getting acting roles and made the switch. “And it’s funny because my dad did the same thing. He started as a musician, signed to Motown (Records) and he became a comedian”. Playing a variety of striking characters, she would be prominently cast in such films as The Color Purple (1985), Beat Street (1984),American Flyers (1987), Soul Man (1986), Commando (1985) and Tales From The Darkside: The Movie (1990). 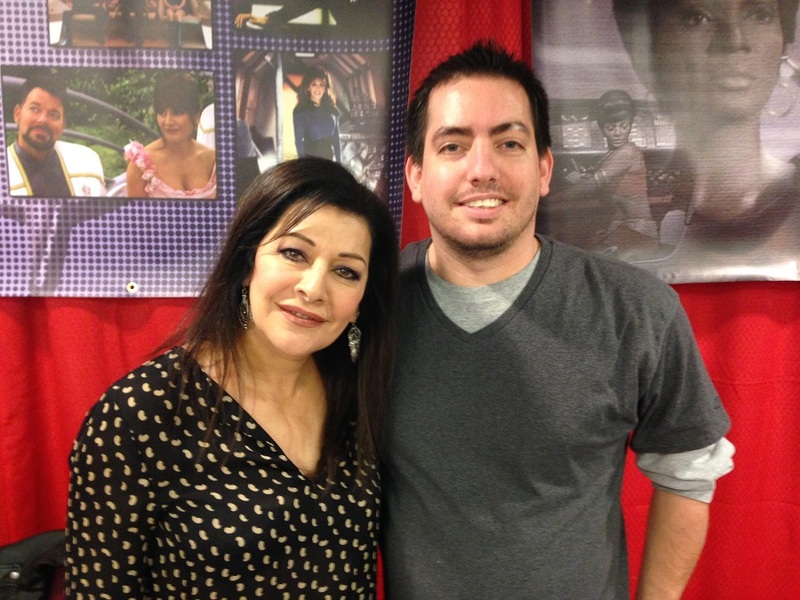 The 2nd guest I got to talk with wasn’t originally on my “Celebrity Bucketlist” but boy was I ever so happy that I did was Marina Sirtis. What a wonderful woman to be around. Sassy at times, funny at times and just a pleasure to talk with. Sirtis recalls that on the day she received a call offering her the role of Deanna Troi, she was actually packing to return to England, because her six-month visa had ended. Deanna Troi was a half-human, half-Betazoid. Her Betazoid abilities allowed her to read the emotions of others. Her position on the Enterprise-D was ship’s counsellor, looking after the crew’s well-being and a trusted advisor to Captain Picard with a position seated next to him on the Bridge. 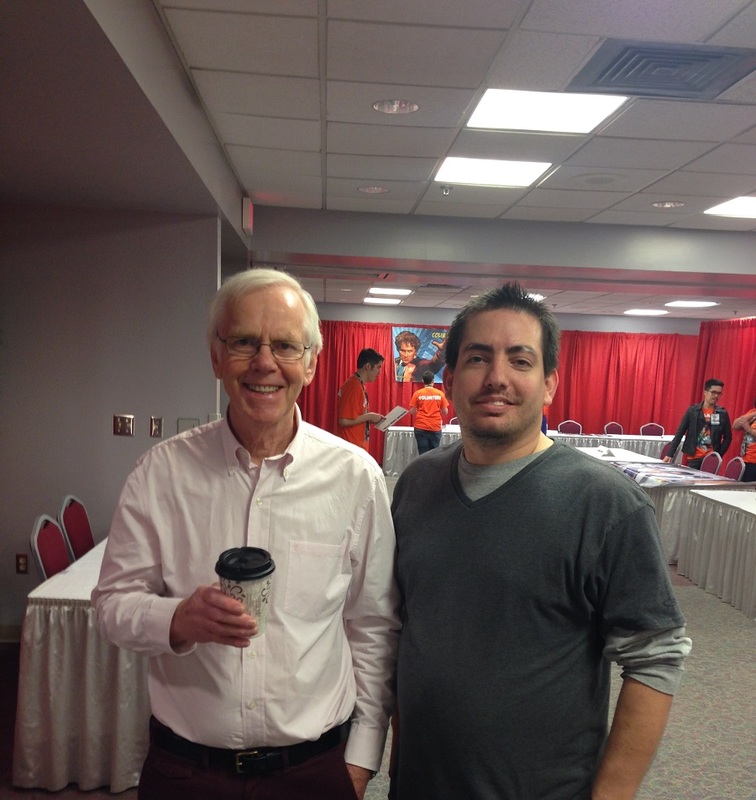 The third gust I had pleasure to met and talk with was Bobba Fett himself Jeremy Bulloch. We got to hear some of his stories of being on the Star Wars set as well as recent adventures. Bulloch achieved cult superstardom as intergalactic bounty hunter Boba Fett in The Empire Strikes Back (1980) and Return of the Jedi(1983). Endlessly fascinating and mysterious despite, or perhaps because of, his lack of screentime and dialogue, Boba Fett became arguably the series’ most popular character, spawning countless spin-off projects, both fan-made and official, including an origin storyline in Star Wars Episode II: Attack of the Clones (2002). Although Bulloch had a long career before and after Boba Fett, he was forever assured a loyal fanbase for his work as the bounty hunter, notching a speaking cameo in Star Wars: Episode III – Revenge of the Sith (2005). A testament to the unpredictable nature of fame, Jeremy Bulloch may not have been a household name or recognizable face, but his turn as Boba Fett was most assuredly as immortal as any pop cultural character could ever be..
Next up was Alan Oppenheimer a favorite of mine growing up! Alan might not have a face you remember, but his voice you would never forget! 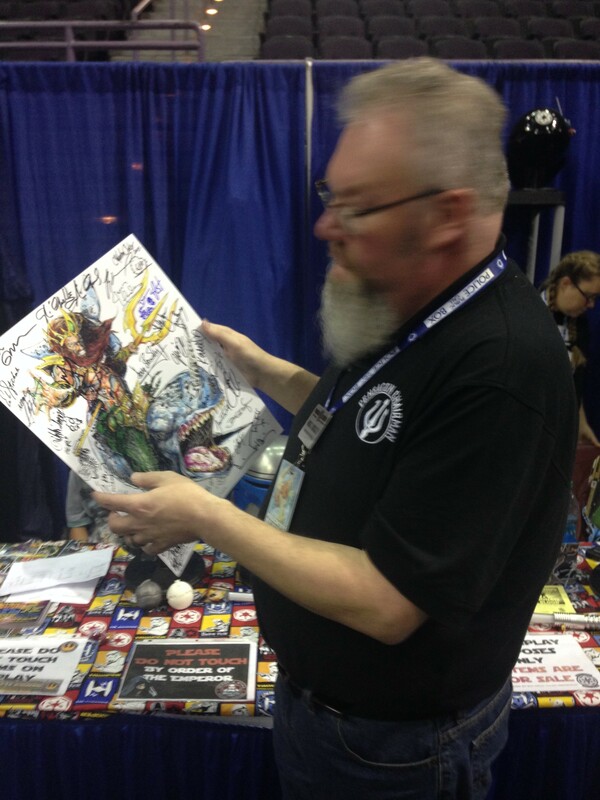 Alen is the man behind many voices from Falkor, Cringer, Vanity Smurf as well as Skelator and many many more. I only got to spend a few minutes with Alan as soon as the doors opened, his lined grew very quickly! He is recognized as the voice of many characters, often for Filmation in the 1970s and 1980s, such as Mighty Mouse, Ming the Merciless on Flash Gordon, the Overlord on BlackStar, Skeletor, Man-At-Arms and Mer-Man from Filmation’s 1980s cartoon He-Man and the Masters of the Universe, and the voice of Prime Evil in the 1986 TV series, Filmation’s Ghostbusters. Other notable voice roles include Thundarr the Barbarian, Vanity on The Smurfs, Rhinokey and Crock from The Wuzzles and Falkor, Gmork, Rockbiter, and the Narrator from 1984′s The NeverEnding Story. In the early 1990s, Oppenheimer was the voice of Merlin inThe Legend of Prince Valiant. 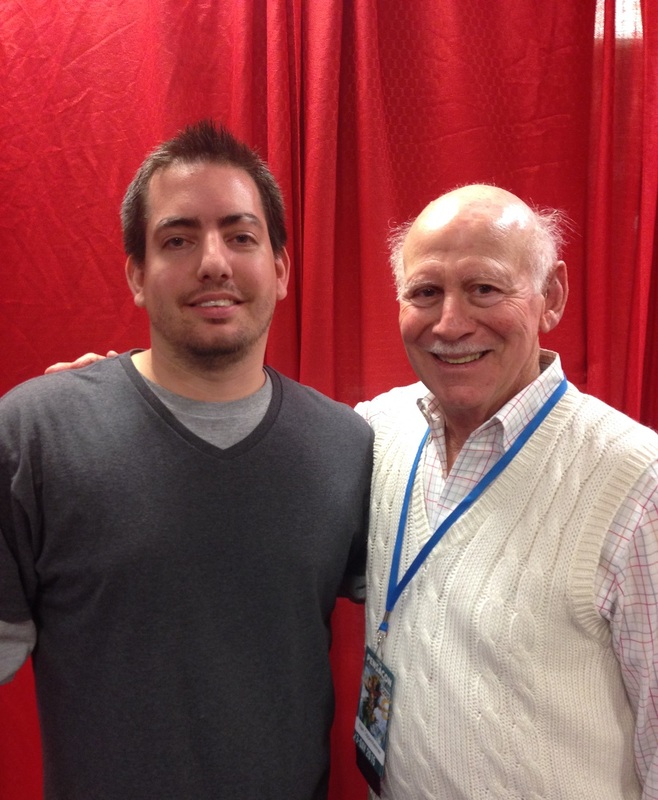 One of the last guest I got to take my picture with and talk to was David Warner. His body of work and list of accomplishments could take up pages. I only got to speak to him for a few seconds, as he was only there for 2 of the 3 days and had a large line waiting on him. He can be seen in some of the top sci fi movies around, and has one of the most complete resume’s I’ve seen. In movies he has worked with John Carpenter, James Cameron, Tim Burton, Wes Craven and three movies with the Legendary Sam Peckinpah. Movies include: Star Trek V, Star Trek VI (Chancellor Gorkon), Tron, Time Bandits, The Omen, Titanic, Time after Time,Teenage Mutant Ninja Turtles 2: Secret of the Ooze, Scream 2, The Man With Two Brains, Tales from Beyond The Grave, Tim Burton’s Planet of the Apes, and Waxwork.